One of he biggest local items this week was the opening of the opera. We’re of the century of the common man [people] ourself, but we wanted to see how the other, or Frank Crowninshield half, lives. Just before 9, the REAL, REAL personage arrived. Beekman stood in silent awe. We didn’t have to say anything. Mrs. George Washington Kavavaugh stood there, supporting her diamonds and emeralds. Of course, everybody REAL had worn a few diamonds but this was a display. And Mrs. Kavanaugh just stood there while everybody stared – beaming in simple, unashamed, childlike joy. The completely unsophisticated pleasure of the crowd at the sight of those jewels astonished us. Up to this time, everyone had been keeping up the show of being as snooty as the next fellow, quite accomplished to this sort of thing, don’t y’know. A woman behind us murmured “disgusting,” but her heart wasn’t in it. For the third consecutive year Weegee’s strategy: “I wanted to get something different than the usual Society celebrities” was successful. For the second consecutive year Mrs. George Washington Kavanaugh was in PM‘s coverage of the Metropolitan Opera’s opening night. Many opera goers wore black and many wore uniforms for the first wartime opera opening since 1917. (The “two chauffeurs” bit might be more of a joke than factual.) Perhaps Mrs. Kavanaugh was (and will be) an obvious and ostentatious target for satire. The opening on Monday, November 23, 1942, sets the scene for the next opening in 1943. Dr. Bertram Cecil Eskell graduated from Oxford and the Royal College of Surgeons of England. At his wedding to Ludmilla Aissa Alihan at a Russian Orthodox church on East 121st St. the actor Raymond Massey was the best man. The Times reported that two mink coats valued at $700 ($10,537 today) and $1,650 ($24,836 today) were stolen from two New Jersey women during the intermission after the first act. The “Lee” in the “To Lee” inscription is the great New York photographer, friend of Weegee, and ICP librarian Lee Sievan (1907-1990). Will Weegee return to the Metropolitan Opera for the the opening night festivities in 1943? If so, will he “get something different than the usual Society celebrities”? 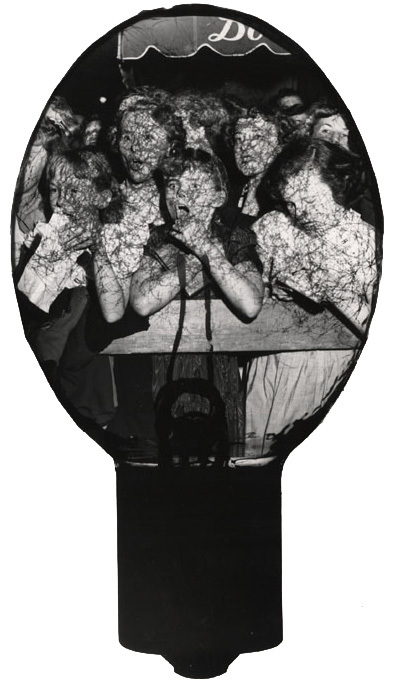 This entry was posted in Fans in a Flashbulb and tagged 1942, Manhattan, Metropolitan Opera, New York, New York City, opera, PM, The Critic at 75, Weegee. Bookmark the permalink.